HomeKeepr keeps agents in touch with clients after the close. But for how long? I never recommend restaurants to people. You just never know if that’s the night a server was served with divorce papers, or if the line cook forgot his hairnet. Experiences vary. Service is up and down. Even the best chefs have bad nights. If an agent is going to hinge their ongoing relationship with clients to the hopes of a consistently high level performance of a “preferred vendor,” or service at their “favorite cafe,” then I feel they’re putting their brand at risk. I feel you should never handcuff your brand to a performance outcome on which you don’t have control. This is what HomeKeepr does. 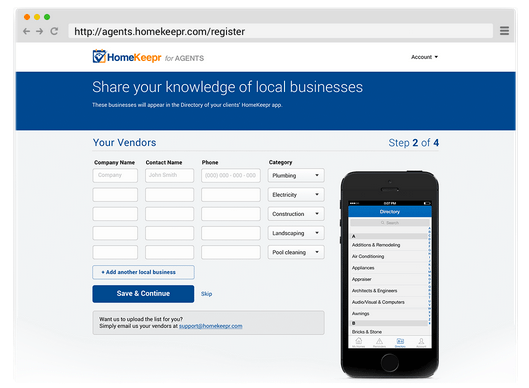 HomeKeepr is a home vendor recommendation app that agents gift to their clients. After a sale, you simply send them the link for download. 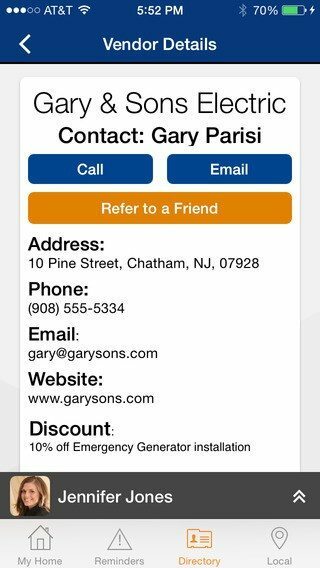 The app comes labeled with your headshot and contact information. HomeKeepr lets you send notes and updates about local events, and it automatically pushes home upkeep alerts to users. The ultimate point here is to remain in front of your clients for the duration of their time spent in the house you sold them. And that’s where I think HomeKeepr is fundamentally flawed. I take no issue at all with the quality of the programming, the look and feel, or the initial effectiveness of the app. But six months after the close? A year? I have a very hard time believing that in five years, that app is going to remain in place on users’ phones, regardless of how many push notifications are sent out. Almost weekly, I’m doing a quick scan of unused apps just for ways to free up some phone storage. Apps I thought were awesome last night turned out to be attractive icons with slow-to-load, buggy content under the tap. If it’s been three months since something’s busted in the house, I kind of have an idea of what’s not going to make it through the next app culling. HomeKeepr looks to eliminate this out-of-touch-out-of-mind challenge by using a pre-ordained list of major home systems as a basis for sending maintenance reminders. Users answer a few questions about heating and cooling, home location, roof type and floor materials, and HomeKeepr sends alerts when something should be flushed or finished. Users do have the option of turning off or limiting the notifications, however. Still, I think the absolute best market for this app are first-time homeowners and buyers who have relocated. There is no question that agents provide an invaluable service in providing relocation packages and names and numbers. From a marketing perspective, HomeKeepr makes an excellent, affordable value add. For a while. 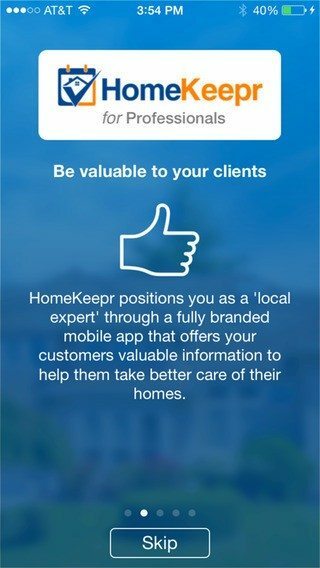 Experienced homeowners moving within the same market may not be the best audience for your HomeKeepr app. For $9.99, you get 100 clients, so you’ll have some accounts to spare. When agents log in, they see a clean dashboard with a recent run-down of how many vendors and clients you have, plus a tally of how many emails have been sent to clients. This is a good reminder of how active you should be. I wonder, though: How do emails sent in HomeKeepr get reconciled with a CRM (customer relationship manager), or other robust contact engine in use? It may not be crucial, but it does help to collate all touches to clients. The app functions nicely. Maintenance recommendations are described in detail, along with tips on handling it yourself. 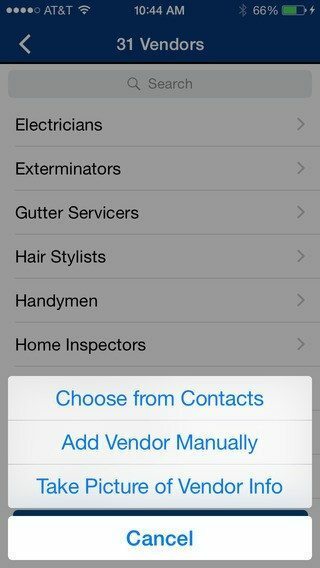 For more complex tasks, the preferred vendor for a repair is a couple of taps away. If for any reason one isn’t set up, HomeKeepr swiftly generates an email for the user to ask for one. It’s pretty smooth. Agents can also provide alerts about local events and other nearby services, like soccer tournaments and physical therapists. I owned a house for a long time. I was no where near as diligent in its upkeep as the app implies I should have been. I wonder, how many homeowners are more like me? And I don’t have kids who need rides to skateboard parks or high school drama events to attend. Again, HomeKeepr looks great. It functions well, too, even if its calendar of maintenance ideas is a bit presumptuous. I’m not inspecting my driveway. With ongoing upgrades to the app and consistent attention by agents, it could work. Localytics reported in September 2014 that the percentage of apps used only once declined to 20 percent, down from 26 percent in 2010. My issue is with its positioning as a long-term marketing facet for real estate agents. At best, it’s a supplement. Mobile user habits alone dictate it would be three screens deep within a few months after closing. Plus, as soon as the first vendor is late to an appointment with a busy mom, there’s going to be some trust issues. I think agents should try HomeKeepr for new and relocating buyers. That’s the best use of it. After six months to a year, make sure your CRM is working as it should. Do you use HomeKeepr? What do you think? Leave a comment and let us know!